UPPSALA, SWEDEN – Dirac Research, the global leader in sound optimization technology, today introduced Dirac Connect, a first-of-its kind cloud-based service that allows end-users to download Dirac’s suite of audio optimization solutions directly to their mobile device. The optimizations are adapted to work with specific headphone and speaker models and unleash their fullest potential for extraordinary listening experiences. Dirac Connect, which will be offered to end-users through mobile device manufacturers and content providers, will be unveiled and demonstrated at Mobile World Congress (MWC) 2017 from 27 February to 2 March 2017. The Dirac optimization solutions currently offered through Dirac Connect include Dirac Power Sound, Dirac Panorama Sound, Dirac HD Sound and Dirac Sensaround – the former two are speaker-optimization solutions, compatible with products such as Harman Kardon’s Mini Esquire, while the latter are for headphones. 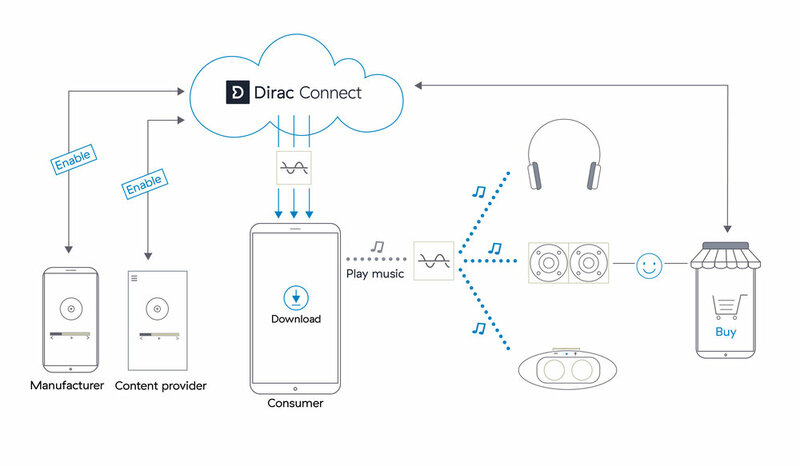 With Dirac Connect, users purchase and download these solutions – specifically the algorithms and tunings of each Dirac solution, designed by Dirac’s golden ears to fit each make and model of the user’s headphones and wireless speakers – through the respective online and app stores of the manufacturer or content provider. From there, device speaker and headphone audio quality is immediately optimized, delivering to the listener a noticeably enhanced listening experience. Dirac’s suite of audio optimization solutions is currently utilized by, among many others, OPPO, Huawei, and Xiaomi – three of the world’s top five largest mobile device manufacturers – in addition to blue chip technology companies in the automobile and home theatre markets such as Rolls-Royce, Bentley, Volvo, BMW, Datasat, Harman, Pioneer, and many more.